The "411 On Fishing" : Blue Walleye Anyone? They do exist. 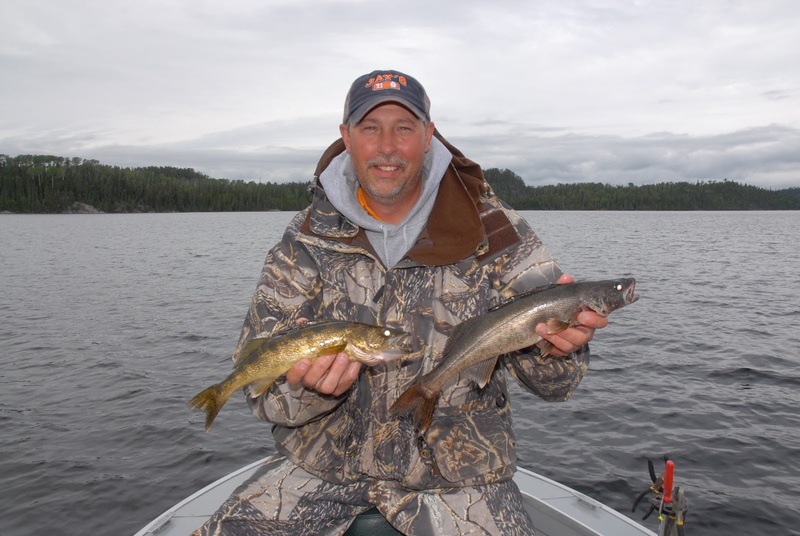 In his right hand the author holds a normal colored “yellow walleye” and in his left hand the famed “blue walleye” of Northwind Lake. The color difference is just a color phase, but it’s not something you see every day! Inspired by Thompson’s description of the “blue walleye” this is something for sure I had to see with my own eyes. The very next day we planned a trip to Northwind Lake, located just a few miles north of our base at Pasha Lake Cabins. The launch at Northwind is pretty sketchy, but we managed to get a 16 foot Starcraft in the water. The first few walleye we caught were the traditional golden yellow color walleye living in tannic acid stained waters are supposed to be. Not that I was doubting the presence of “blue walleye”, but until you see one of these fish first hand it does seem a little like tales of Big Foot. Then it happened... I set the hook and worked a nice walleye close to the boat. When the landing net hit the floor of the boat, there flopping in front of my amazed eyes was the famed “blue walleye” as promised. To clarify, the blue walleye in Ontario are only a unique color phase of the Stizostedion vitreum or common walleye. The famed and extinct blue walleye or blue pike of Lake Erie were believed to be a completely unique species, not just a color phase. These fish disappeared about the same time as the passenger pigeon. As the day progressed we caught several more “blue walleye” proving that my catch wasn’t a fluke. In fact, the ratio of blue to yellow walleye caught in Northwind Lake is nearly the same. It’s also interesting to note that once they are filleted blue and yellow walleye taste exactly the same. However, Chad tells me that when you catch these fish in the winter and toss them on a fresh bed of snow, the snow turns blue! I haven’t witnessed the snow turning blue as of yet, but that is on my bucket list thanks to Chad Thompson and Pasha Lake Cabins. If you decide to target the blue walleye of Northwind Lake, get ahold of Chad Thompson at www.pashalake.com for lodging and fishing details. Chad guides and puts his clients on the famed blue walleye routinely. Be sure to take along a camera, because no one is going to believe the story without photographic proof!